Wine tastings became fun with gimmicky Enomatic Wine Serving System. 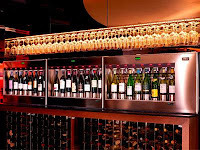 Enomatic is a state-of-the-art computer controlled wine serving system that monitors the operation of each bottle and allows the poured wine to be set to any quantity. The unit features individual bottle positions that can adapt to different sized bottles, electronic push-button operation, and back-lit display. The anti-oxidation feature is automatically activated whenever a new bottle is added in the system. The computer also tells the restaurant how long a bottle has been in the Enomatic. I visited the Tasting Wine Bar in Hong Kong on Friday night. You can taste a wide selection of wines with a variety of prices, that wouldn’t usually be offered by the glass. The bar offers 40 varieties of wines (32 Reds, 7 Whites, 1 Rose), from Old to New World wines. Many of them are unable to sample in normal restaurants / bars without purchasing the whole bottle. Instead of spending more than $500 for a bottle of wine, I can taste half portion of the same wine for $89. They even have wine from Lebanon. They also offer tapas & cheeses (free one serving during happy hours), which are excellent companion to wines. I poured my own glass of wine without touching a bottle! How does the Digital Wine Cellar works? First, you walk over to a big glass-fronted box with wine bottles in it. and -- Huhuu -- dispenser pour your Shiraz. Each bottle is marked with the price per different serving size. The prices changes on a digital display. Cost wise, for tastings portion (i.e. 25ml), price ranging from HK$14 to HK$170 at the top end (Vintage 1997) . The downsides of this bar was that the lights were too bright, and the low ceilings made the room very noisy and when crowded with people. Service could be improved though. Where can I find this wine machine in Hong Kong? Address : 20 Nathan Road, Tsimshatsui, Kowloon, Hong Kong. Address : 27-29 L/G Wellington Street, Central, Hong Kong. An interesting & healthy vegetarian recipe. The banana flavor actually is very subtle. It actually taste like beans curry, not sweet dessert at all. It is quick & easy to prepare, and the flavor can be adjusted according to your taste buds. Heat the oil in a deep frying pan and fry the banana slices in batches, until lightly browned on each side. Drain on kitchen paper. Add the onion to the pan and cook for 10 minutes, stirring occassionally, until soft. Return the banana slices to the pan and stir in curry paste. Pour over half the coconut milk and stir well. Cook for 10 minutes on a low heat. Season. Pour the remaining coconut milk and simmer until the mixture thickens and the bananas break down a little. Garnish with coriander and serve with rice. Where you can eat banana curry in Singapore? A 15-year-old Laska Shop, which have been voted for the BEST LASKA in town. Many magazines, TV & celebrities also recommend. What so special about the Laksa here? Most places serve laksa in plastic bowls. Here, the laksa comes in steamy in original claypot. Claypot not only keeping the laksa hot, it also trap the spicies and flavor into it. The older claypot they use, the more flavor you taste. The soup base here is very rich & thick. Unlike Katong Laksa which is more soupy. The service staff normally ask if you want to add cockle (sea hum). If you're allergy to seafood or have sensitive skins, suggest to skip it. Address: Stall #01-75, AV Hawker Centre, BLK 120, Bukit Merah Lane 1, SIngapore 150120. 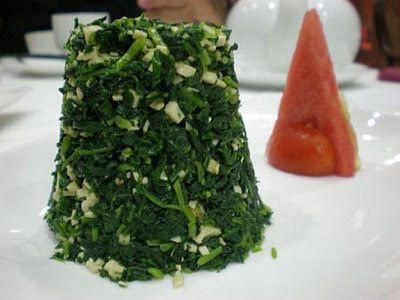 Kalimeris Indica & Tofu Salad (in Chinese: 涼伴香乾馬蘭頭) is one of my favourite Chinese cold dish. This cold salad dish originated in Shanghai. 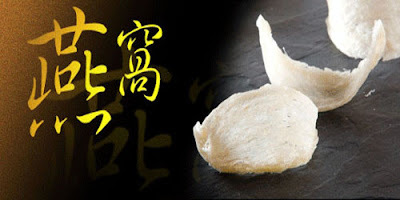 It is also a popular appetizer in restaurants. Wash Kalimeris Indica, boil it for 2 minutes. Drain the water, let dry & cool. Chop the Kalimeris Indica after it is cold. Mixed Salt, Sugar, Sesame Oil, Soya Sauce, Kalimeris Indica, Dried Tofu together. Can put everything in the fridge after mixing, and serve when you want to eat it. Kalimeris Indica must be well drained & dried before chopping. 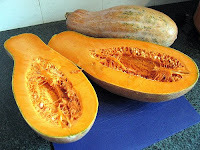 Kalimeris (Chinese: Ma-Lan-Tou) is a small genus with 8 species from the sunflower family. The genus occurs mainly in eastern Asia (China, Korea, Japan). The foliage is herbaceous. The blue-green leaves vary per species and are smooth tectured. The can be narrow and long, round and large teeth or lobed. It usually grown on riverside or roadside, thus, people also called it "sidewalk chrysanthemum". People eat Kalimeris Indica because it is highly nutrition. Besides protien, fat, carbohydrate, it also contains rich inorganic salt & vitamins. Its Vitamin A contents is higher than tomato, while Vitamin C content is higher than mandarin orange. It is believed to be good for the liver, eyesight, and can control blood pressure. I came acorss this Taipei Travel Guide Book when browsing around in bookstore in Hong Kong. By far the best Travel Guide Book to Taiwan I've read, even if you're not on a budget. It describes both the well know sight seeing places, and many great restaurants, some of them out-of-thay-way local eateries. One could hardly find them without a book. Although it is written in Chinese, but you don't actually need to read Chinese to use the book. My Ang-mo friend found it so handy by just looking at the pictures. He simply showed the book to taxi driver, and pointed to the address written on it. Seriously, this kind of guide books are very popular in Hong Kong and Japan. I wonder why there's no English version, and I couldn't find it in Singapore! It's just so handy and easy to use. But don't worry. I found out a link here, where you can buy the book directly from Ming Pao online.